Urban traffic is one of the main problems affecting the quality of life of residents in cities and metropolitan area. Current city models, with a very distributed layout and an urban population in constant growth, contribute to an ever increasing number of daily trips. Besides problems with pollution, safety and energy consumption, providing a sustainable way of mobility for citizens to arrive to their destinations requires new ways of managing urban traffic. Wireless Sensor Networks are now more than a promise to develop and implement real systems. 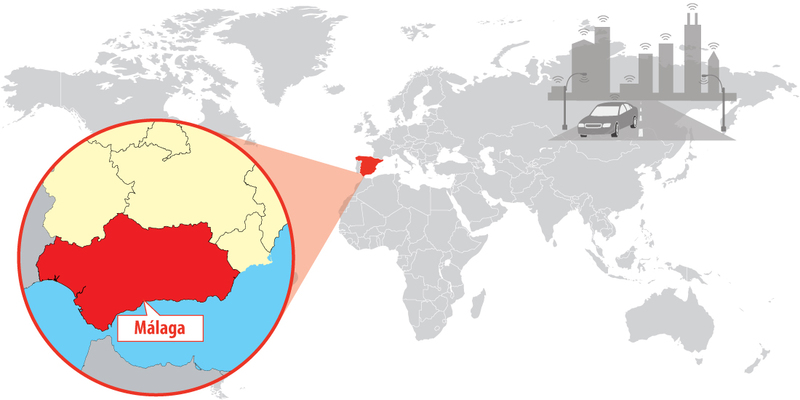 Using this technology as a base, a research group from the University of Málaga has developed an Urban Information System to gather relevant information about city environments, particularly relative to traffic. The group is composed by Alfonso García, professor of Systems Engineering and Automation department, Juan Jesús Fernández, main researcher and Juan Martín and Miguel Martín, R&D engineers. Accurate information is one of the first requirements to achieve the goal of sustainable mobility. Acquiring precise and timely data about travelers movements is the first step to look for an optimization of the available means as infrastructure. While a wide variety of sensors are available, they usually need modifications on the roads and nearby areas (for instance, burying cables), and thus construction works and road closures are a part of any deployment. In addition, most of these sensors provides only vehicle counting and, while some types allow for vehicle identification (opening the way to trend monitoring and estimation), they need means for processing, as in the case of video cameras. This is an investment to add to the construction and deployment works. With the support of a research grant from the regional government (Junta de Andalucía), the Urban Information System (UIS) is a rapid deployment system focused on providing information about traffic, using a set of sensors to gather information about vehicle counting, vehicle identification, noise levels, dust (particle matter concentration PM10), gases concentrations, humidity, etc. 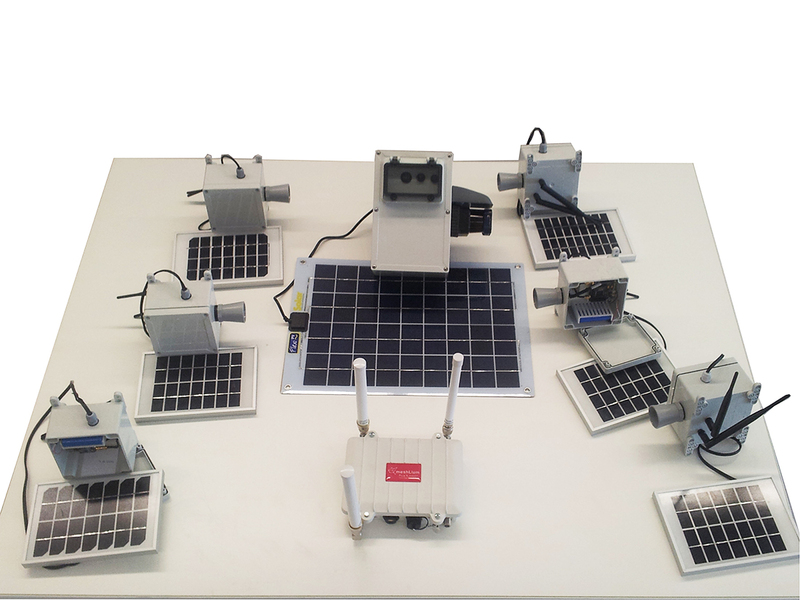 The system is implemented as a Wireless Sensor Network, with different types of nodes, with power supply independence from the grid, and allowing an easy and inexpensive deployment around an area of interest. The chosen area was a section of the Highway A-357 in Malaga (Spain), with a speed limit of 100 km/h and the surroundings of a roundabout with different entries and exits within a short distance. The Urban Information System (UIS) is based on hardware and software provided by Libelium. For instance, Waspmote Sensor Platform, Smart Cities board, gases board, gases sensors, ultrasound sensor, dust sensor, noise sensor and Bluetooth modules are only a few of Libelium solutions integrated in the system. These sensor nodes send the information gathered periodically to a manager node – the Meshlium Gateway – which is also called the coordinator node.. The ZigBee protocol is used for communication among nodes. This protocol has been selected because of its efficient energy consumption and acceptable data transfer rate. Direct access via WiFi or 3G: the data acquired by sensor nodes are obtained and processed in the coordinator node. Later, these data can be seen by a laptop or a computer using WiFi or 3G. Real Time: The coordinator node must synchronize with a computer working as external server, via 3G. This computer acquires and monitors data sent by sensors, processing the information and allowing interaction with an operator. One of the key features of UIS is vehicle identification. Bluetooth nodes acquire the MAC (Media Access Control) of Bluetooth devices located in vehicles traveling on the selected urban area. The Bluetooth node detects also the device type (mobile phones, hands free, laptop, etc.). In this way, the MAC address of a particular Bluetooth device is unique, so it can be used to identify the vehicle carrying the Bluetooth device. The car tracing can be possible through the detection of the same MAC by different Bluetooth nodes of the UIS platform. If a difference of time exists between different intervals of detected Bluetooth with the same MAC, then a trip between a certain origin-destination pair has been identified. This process is used to calculate the Origin-Destination matrix. The O-D matrix is a powerful tool for traffic management, containing the information about the way vehicles are moving between different points of interest. It is noteworthy that privacy rights are preserved, since MAC addresses are not linked to any individual. But a total count of vehicles is needed to calculate the O-D matrix. UIS uses ultrasound and laser nodes for that purpose. The first of them detects vehicles crossing the sensors beam. The second type sweeps the driveway analyzing the existence of vehicles. The advantage of a laser node with respect to the ultrasound node consists in the capability to detect a vehicle and the lane it is using. On the other hand, ultrasound node has a simpler, cheaper and faster installation. It can be positioned in any street element, while the laser node needs to be placed at a height of 7 or 8 meters. The UIS has been tested in different real-world scenarios. Since it is based on a wireless network, different layouts can be easily adopted to cover different road configurations. The real areas can be shown in the SCADA interface. 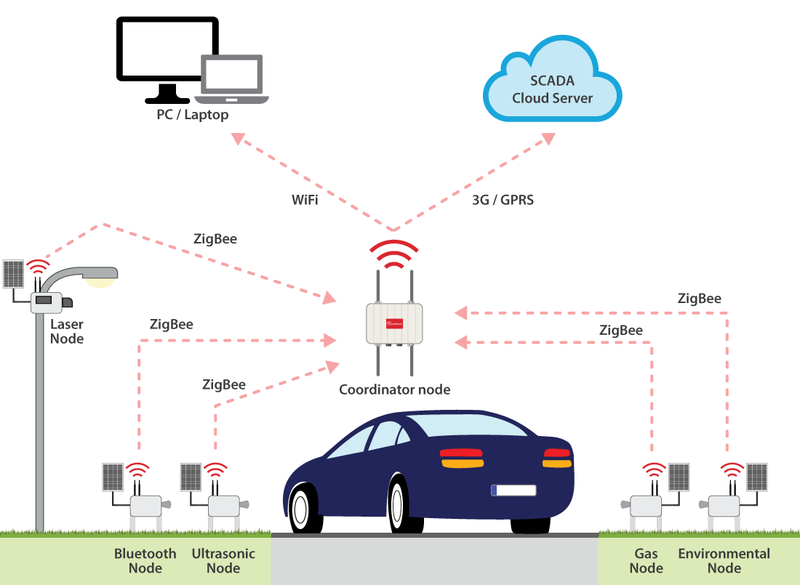 This project presents a wireless sensor network designed to characterize urban traffic parameters. In particular, vehicle counting and identification are the key to obtain information about origins and destination of trips in the area under study. This data allows the calculation of the origin-destination matrix in real time, providing city managers with a powerful tool to adapt traffic planning to real demands. Up to now this matrix required an extensive field work linked to roadside interviews and needing weeks or months to be completed. The system has been validated in real conditions. Transmitter nodes have been tested separately and data about detection using ultrasound and Bluetooth have been obtained. The complete system have also carried out proving its capability to calculate an origin-destination matrix in real time, with acceptable accuracy. The UIS is possible to be deployed by a wider geographical area, as a city. Besides, calculations can be refreshed in real time through the SCADA system, allowing traffic managers to obtain an information that up to this moment required weeks or months.